A sweet blog reader asked if I could alter my 2014 Mutual Theme YW Newsletter Template so she could use it for Relief Society. I loved her idea and made a Relief Society Newsletter Template for her and all of you! My Relief Society Newsletter Template has customizable areas for adding your ward/stake name and a scripture or theme (I used the Mutual Theme above, but you can type in anything) as well as four areas that can be used for lesson schedules, calendars, birthdays, spotlights, visiting teaching, activities, welcome or anything you want–customize the titles and text in each area to fit your needs. The customizable/editable PDF file is so EASY to use! Simply open it up in Adobe Reader (get this FREE program here), type in your text, save and print. Font size, color and style are all preselected for you. If you want to use Photoshop/Photoshop Elements, Word or other software to add clipart or change the fonts, I’ve included a print-quality JPEG file as well. 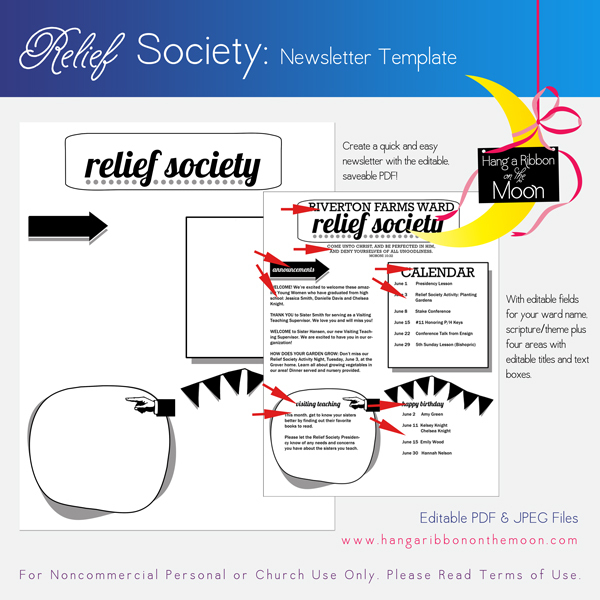 You can download my Relief Society Newsletter Template here. Thanks so much for stopping by! Don’t miss a post or project: Follow this blog via email (sign-up in the right-hand column). Thank you so much for sharing your amazing talents to help build up the kingdom in your own personal way! I have used many of your great ideas in my YW calling but now that I’ve been released (sniff), I am delighted to see this beautiful RS newsletter template! You’re a great example to me of selflessness & I have appreciated you for a long while now & thought it was about time to say so 🙂 May God continue to bless you for your sweet service! Awww….you are so sweet! Thanks so much for your kind words. You made my day! Any chance you have a 2015 YW newsletter template made? Yes! I will work on it after I get the 2015 Calendars done. 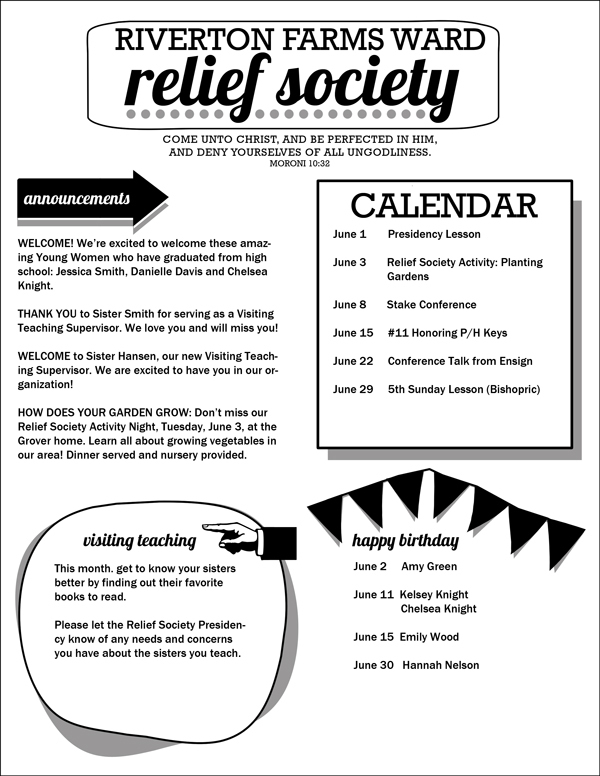 Will you be making another relief society newsletter template with the YW theme on it for this year? Our relief society theme is the same as the YW theme and I love your newsletter format! This is beautiful and I just got called as my ward secretary. I would love to use your template. Can you tell me what font you used for “visiting teaching” and “relief society?” I would like to create a second page (our president wants more info on ours) and I’d love any advice on where to get the fun black graphics as well. Thanks! I am excited you want to use my template! The font is Lobster, which you can download here: http://www.dafont.com/lobster.font. I created all of the graphics myself (except for the hand, which I got from a dingbat font and altered a little). this is wonderful! I am trying to adapt it for our ward here, but need to change “relief Society” to the Norwegian name. Is it possible to edit that? Hi, I absolutely love this!! However I downloaded it so I could edit the document and now that it’s done it doesn’t give me any way to share it. Is there something I need to do to be able to share it by email or facebook? Also, the example down loaded with the editable document and I was wondering if it comes without so I can share it without the extra page? Thanks you so much!! You should be able to share the PDF once you’ve saved your edits, just email it or post it. However, others viewing the document will need the latest version of Adobe Reader to see your edits. You can download a single-page version here: http://bit.ly/1tIByC9. Thanks for sharing your talents! I am in charge of our RS newsletter and I love this template. I downloaded the “free” Adobe reader but it won’t let me open or edit anything without a paid subscription of 14.99/month. Am I doing it wrong? I also tried opening the doc in word and it said it wasn’t compatible. Any help you can give would be great. Thank you! Thank you for this great editable for church use. My RS President wants a change in the newsletter and I am not good at designing and creating things like that on the computer. I was trying to type in the text fields and the fonts are defaulting to Times New Roman or something similar. 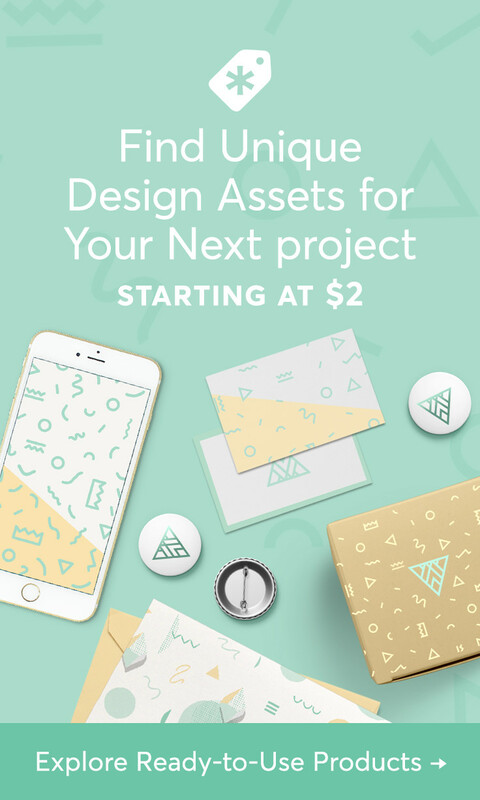 Can you give me a list of the fonts that are used and preset so I can download them and see if that helps. Thank you. Hmmm…that is strange. Do you have the most recent version of Adobe Reader? The fonts I used are Rockwell, Franklin Gothic and Lobster. Thank you thank you thank you!!!!! This made my life so much easier. You deserve an award. This is so great! Any chance you could email me a Relief Society pdf of the newsletter without the instructions attached? 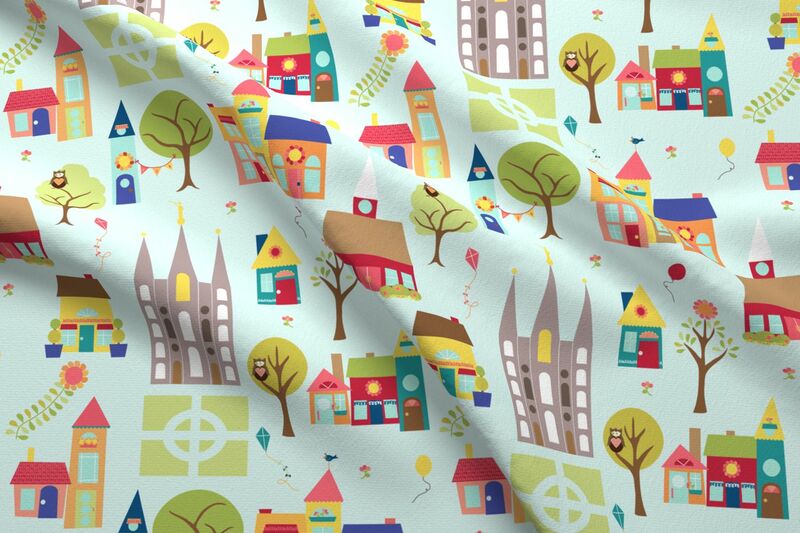 I found it for the YW’s newsletter, but I’m not seeing if for RS. Thank you! Thank you so much. I hope it is as easy as it sounds!! I’m a little older “techy” with a RS Newsletter calling!! I need help, don’t know a thing about computers and need to do a monthly RS newsletter for church. Do I need to purchase a program to download and unzip…..sorry to old to learn new tricks. No, you do not need to purchase a program to unzip or download. To download, click on the underlined text at the bottom of the post (download my Relief Society Newsletter Template here). Follow the prompts on the pop-up that appears. To unzip, right-click on the downloaded zip folder. Select “Extract All,” navigate to where you want the file to be, click “Extract.” You will need to download the free program Adobe Reader to use the editable PDF. You can find it here: (UNCHECK the boxes in the “optional offers.”) https://get.adobe.com/reader/. This is so great, thank you for sharing! I am having a little trouble downloading and editing it as well. I can’t seem to figure out how to delete the first page as well. If there a way you can send me a version without the first page? Thanks! !